get up-to-date information on upcoming conferences via our GitHub page. It’s important to note that these costs are the prices of an industry ticket for the conference only. If you caught the tickets on early bird and are an academic/student you could see these prices fall by over 50% in some cases. I’ll also mention extra pricing below. Now, with add-ons it could have been a whole different story. 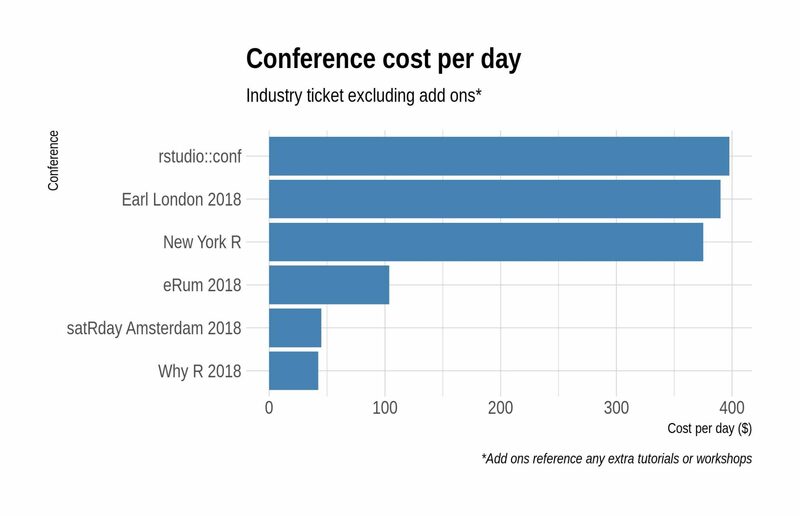 For example, if you wanted to attend any of the 1 or 2-day workshops for rstudio::conf 2018 before the actual conference, you’re looking at adding an extra overall $995 – 1500. However, conferences like eRum and WhyR have no extra pricing. Clearly, the cost is only one of many factors used when deciding to attend a conference. Location, networking, date and speakers all play a part. In particular, we are planning on attending the rstudio::conf in 2020, even though it’s one of the more expensive events (but it looks fantastic!). In fact, next year the conference is in San Francisco (Jan 27-30th, 2020). The first 100 ticket purchasers will get the special price of $450!